In a large store, guide your customers through the shopping process by employing a virtual assistant. Prepare a series of smart questions to bring shoppers to a desired destination/page. Visitors don’t always know what their options are when they come to your site. If the choice is too wide or the product/service they are looking for is difficult to describe, your visitors may eventually give up and leave your store. 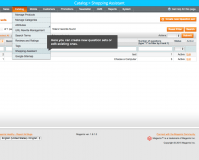 Product Questions and Answers is a smart way to guide your customers through the shopping process. Prepare a set of questions to customers and guide them further depending on how they answer. 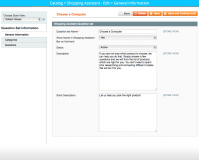 Shopping Assistant with Product Questions and Answers is flexible: it allows customers to skip questions and most likely your visitors won’t need to go through the entire questionnaire. This significantly speeds up the search process and makes it more fun. Use it on a medical site to direct customers to the right specialist. Employ a virtual assistant on a technical site where shoppers don’t know how to describe the item. Add a personal and fun touch to your customers’ shopping experience. Purchase decision-making is not only a difficult task for consumers, but also a challenge for retailers, as they have to do their best to make this decision play out in their favor. To tackle that, guide customers through their journey via a set of pre-defined questions using the extension. This way you will narrow their choice to just few items, helping them avoid the frustration and confusion caused by a huge product assortment. With its smart algorithm, the extension processes customer’s answers to the questionnaire and showcases a range of relevant products. As a result, buyers get a highly-personalized and targeted product recommendations that might suit them best. Implemented on your website, such a feature will accelerates the overall purchase-decision making process and increase the chance of a successful order placement. Any kind of online shopping assistance does a good term for customers, however it might be out of budget for a retailer to implement chat-bots or 24/7 support on the website. Thanks to the module, Magento merchants can help their customers throughout the shopping process without making a considerable investment into it. 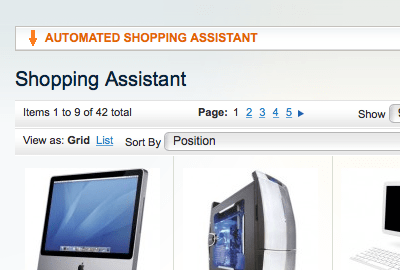 Place a “Shopping Assistant” bar to the front-end of your Magento shop. 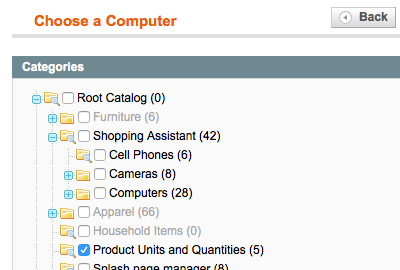 Assign a series of questions to selected product categories. Automatically show only products relevant to the customer’s answer. Make the next question depend on an answer to the previous one. Allow customers to skip questions or go back to change their answer. Allow customer to reset all answers and start from scratch. 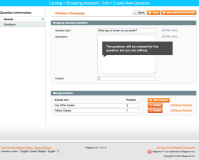 Allow customer to minimize the Shopping Assistant bar at any time and use the product selection based on their answers. Create an unlimited number of question-answer pairs within a set. 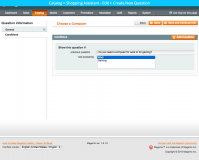 Associate an answer variant with a particular product in your store. Hand-pick the products that should be associated with an answer variant, or specify an attribute to be used to get products for this answer variant. Allows for different values of Text Fields for different store-views. Magento Product Designer extenson for Magento – Allow buyers to personalize your products with pictures, clip-arts and text objects. Upload a gallery of images and fonts to choose from, select any number of customizable areas, and change the prices of custom-designed goods. Product Custom Options for Magento extension – Create templates with custom product options and reuse them whenever needed. Set specific dependencies between options and values and assign multiple products to any existing template at one go. 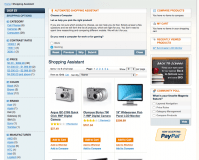 Magento Frequently Bought Together module - Take advantage of upselling and cross-selling at your store. Showcase similar and alternative products as well as best sellers as visitors browse your product pages to increase the chances of a purchase. * Fixed an error when using filtering by category. * Fixed compatibility issue with Magento patch SUPEE-6285 for sub-admin with restricted resources. 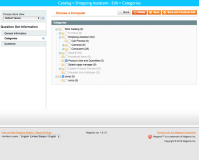 * Fixed an issue with incorrect location of shopping assistant in Magento CE 1.9.1.0. * Fixed an issue with displaying incorrect result on layered navigation after filtering. 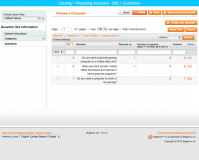 * Compatibility fix with AITOC Magento Booster extension (fatal error when configuring an answer for shopping assistant). 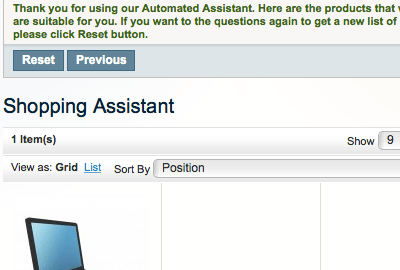 * Fixed the issue with questions nesting when using multi-select attributes. * Fixed the question condition issue. * Fixed the issue with conditions combination "if ANY". 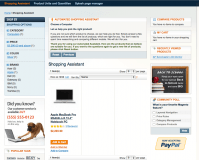 * Fixed product quantity issue in layered navigation when using shopping assistant. * Minor design issue fix. * Fixed the condition issue when using attribute set. * Fixed the issue with not displaying results when attribute is dropdown. * Fixed bug with SQL error. * Fixed bug with error notice on the front-end when there is a question without answers. * Fixed bug error notice, when saving question. * Fixed bug with conditions becoming empty when pressing cancel in conditions configuration block. 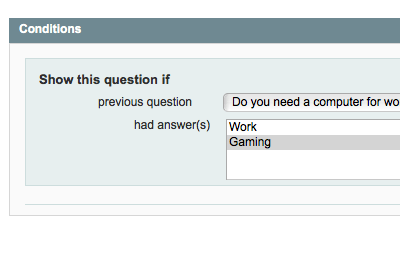 * Fixed incorrect representation of questions area after quick double click. * Fixed bug with crashing with answering some questions. * Fixed bug with error when choosing an answer. 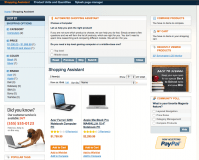 * Fixed bug with crash when searching for a product by SKU. 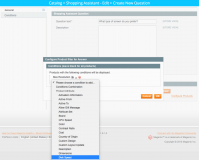 * Fixed bug with SQL error if we create a question set when Magento tables have prefixes. * Fixed bug with answer condition saving in Magento 1.4.1. * Compatibility fix with Magento 1.4.x. Best product ever ! it was exactly what i need and was expecting. Great support too. 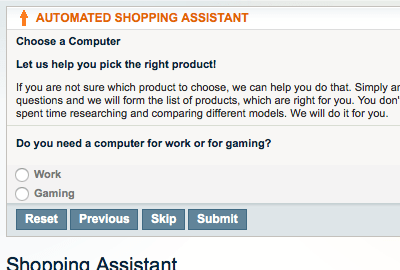 I've recently acquired the Shopping Assistant and it was the tool I just was looking for. A very powerful add to any shop and a perfect helpful for the customer to find the right product. It helps a lot to make more sales and the tech support, in any case of doubt with the tool, is very quickly and effective. It's easy: a happy and confortable client with your shop, with the right tools to make easy the sales, is a buyer for sure. The Shopping Assistant make it possible. Definitly, it worth the money. Impress your customers and boost sales with stunningly visual attributes. Easily add free files such as PDFs to a Magento product for customers to download. Block access to selected content in Magento and make visitors accept your conditions before they proceed. Add custom fields to account registration form in Magento.